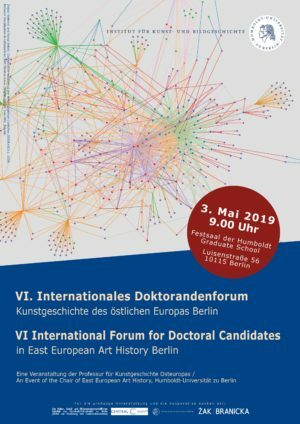 The annual Berlin „International Forum for Doctoral Candidates in East European Art History“ was initiated by Prof. Dr. Michaela Marek (1956-2018). The Chair of East European Art History will continue the Forum also in 2019 – already for the sixth time. Previous editions of the forum have shown us that young scholars from all over the world working in this field have a strong need for a direct, lively exchange of specific conceptual issues and methodological problems of art historical “area studies” of Eastern Europe across the different epochs.